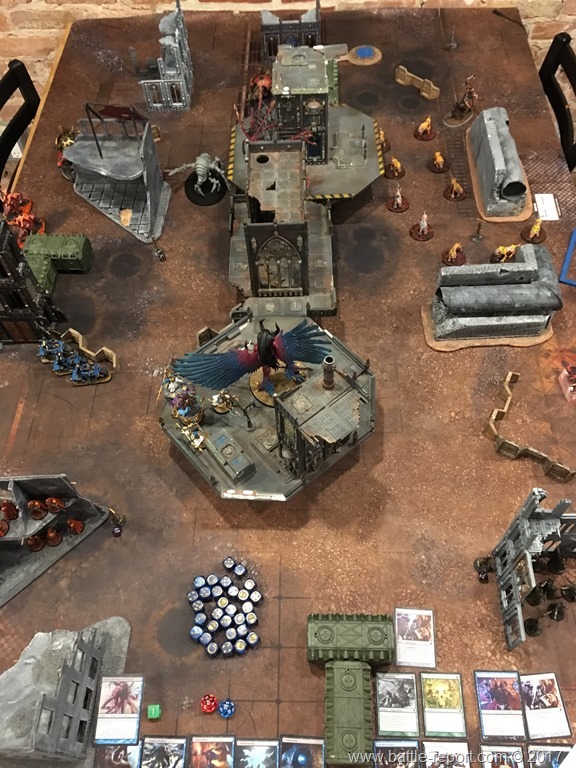 Followers of Khorne deployed first and had the first turn. Red team deployed agressively forward waiting to do its scout moved to get even closer. 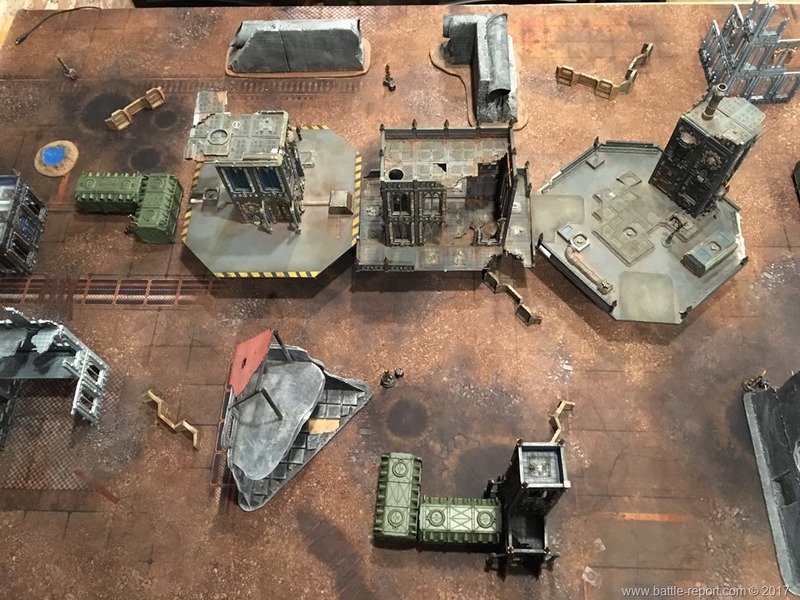 Maulerfiends were holding the flanks and rear. 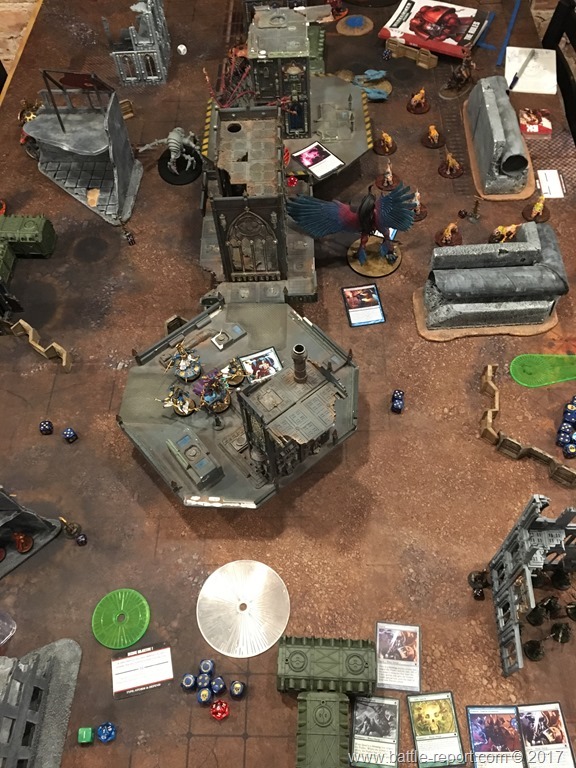 Blue Team had cultists on the flanks sitting on two Objective markers in ruins with bikers up on the left flank and Magnus, Ahriman and the Socerers at the top center of their deployment zone waiting for the brunt of the Daemonkin charge. 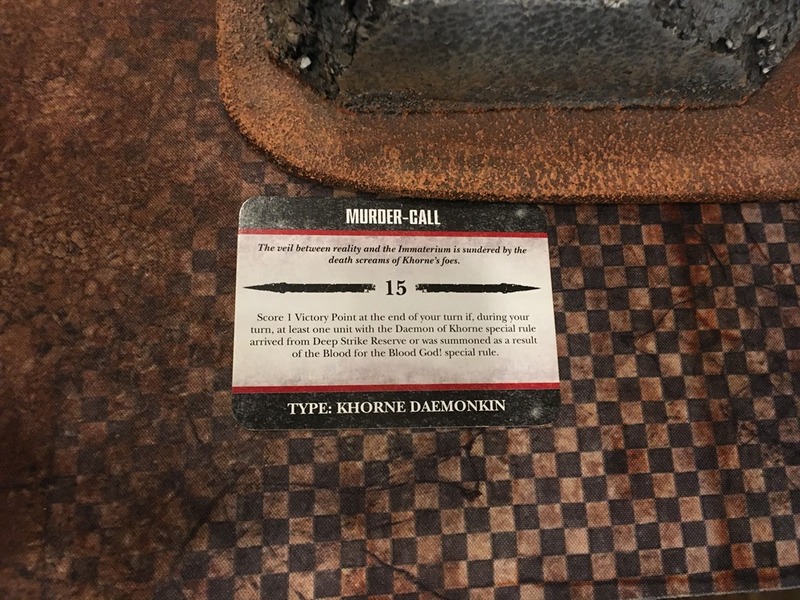 Khorne Daemonkin drew the Murder-Call tactical objective on turn 1. Then started moving, followed by running forward toward the thrice-cursed followers of Tzeentch. 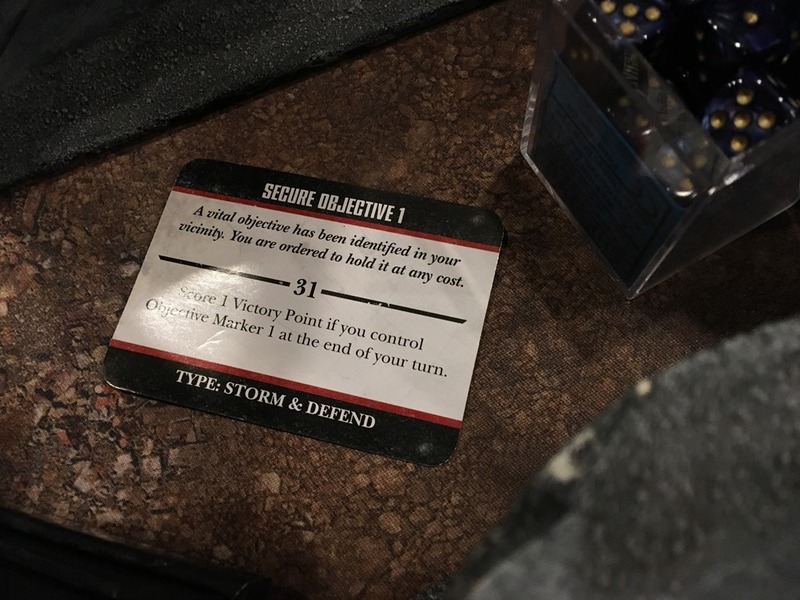 Magnus drew the Secure Objective Maker 1 tactical objective card. 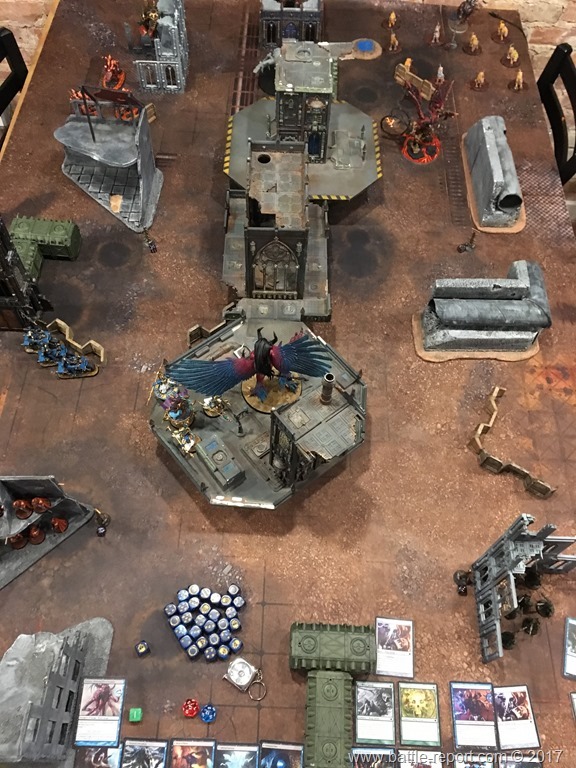 Magnus took to the skies and started flying towards the Khorne Daemonkin Warlord. 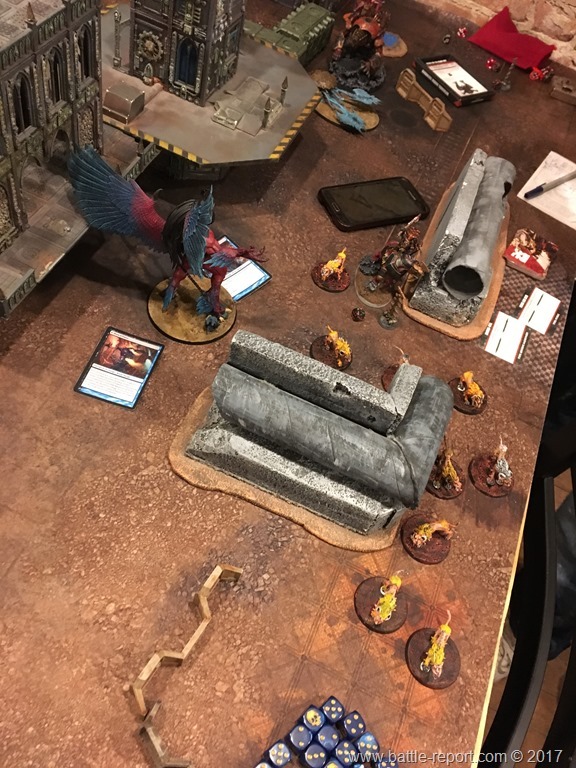 Sorcerers cast endurance on their unit on top of the Skyshielf landing pad, and manifested Death Hex on the Bloodthirster that was gettig really close, reducing its invulnerable save to 6++. 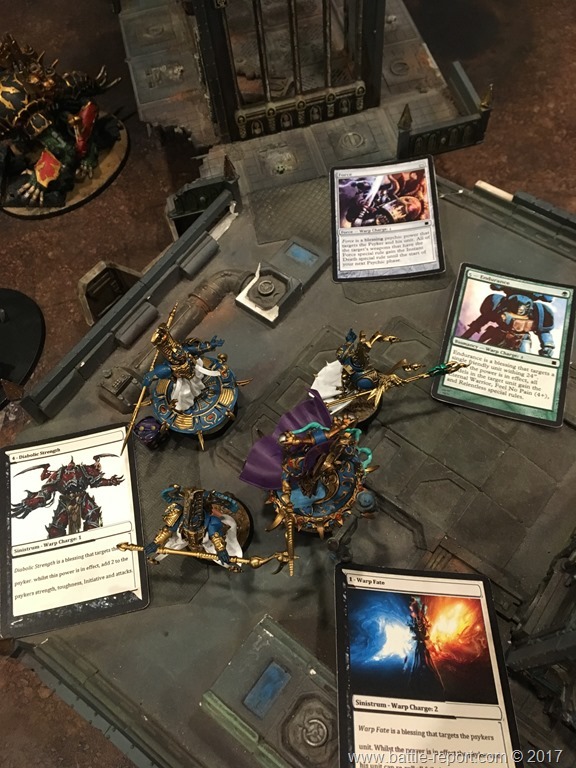 Magnus was able to conjure up a Burning chariot of Tzeentch. 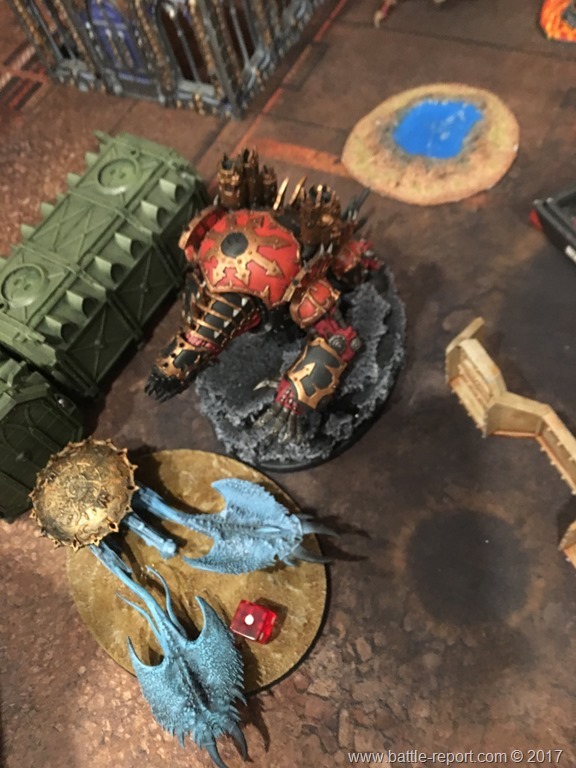 He also hit the flying deamon of Khorne with a Destroyer Weapon attack that managed to take only one of its wound away. 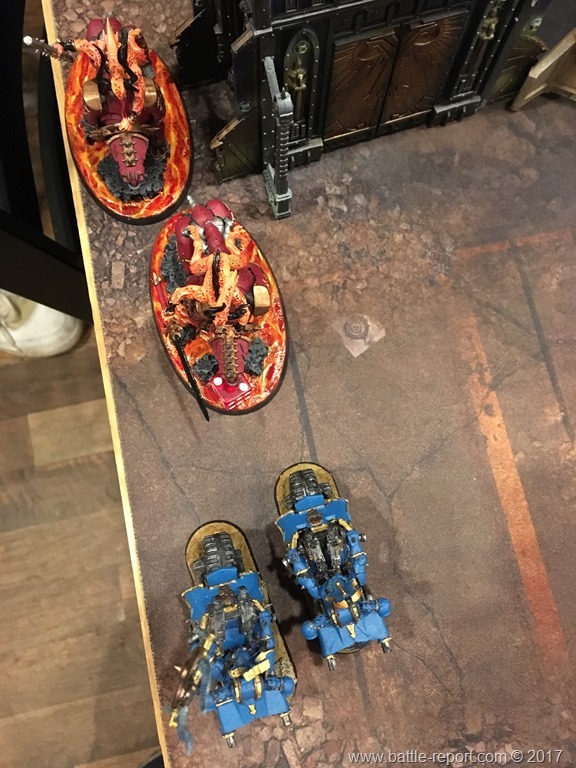 Tzeentchian Daemon riding on the Chariot used its Torrent flamer attack to inflict some wounds on the big unit of Flesh Hounds. 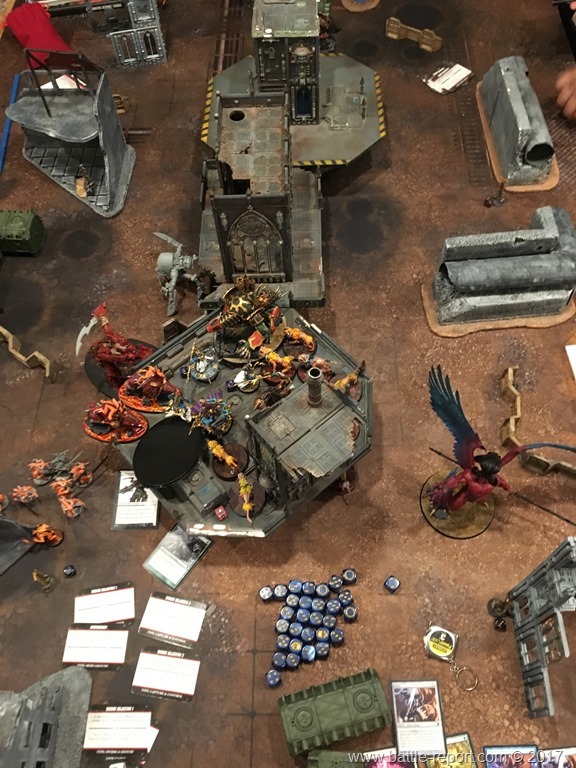 On the other side of the battlefield, Thousand Sons bikers managed to shoot down one of the Bloodcrushers moving down the left flank. 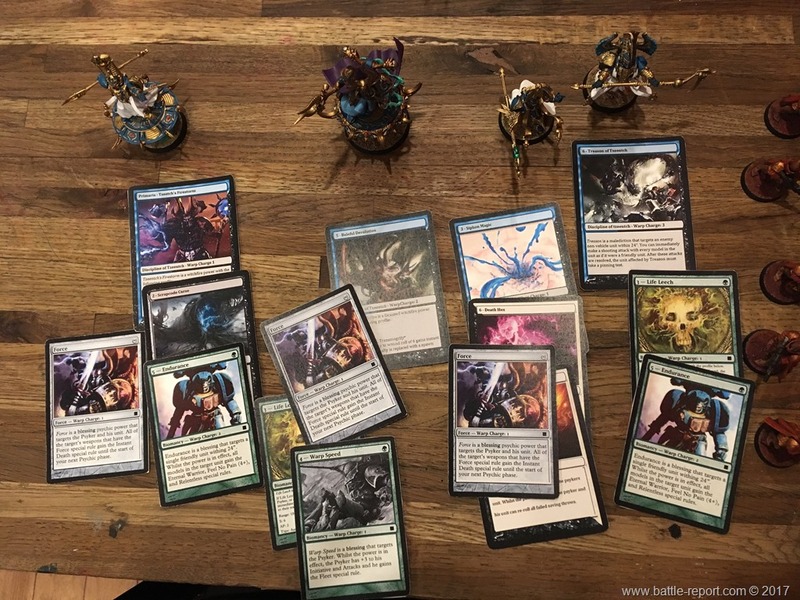 At the end of Turn 1 result was 1:0 Blue Team. 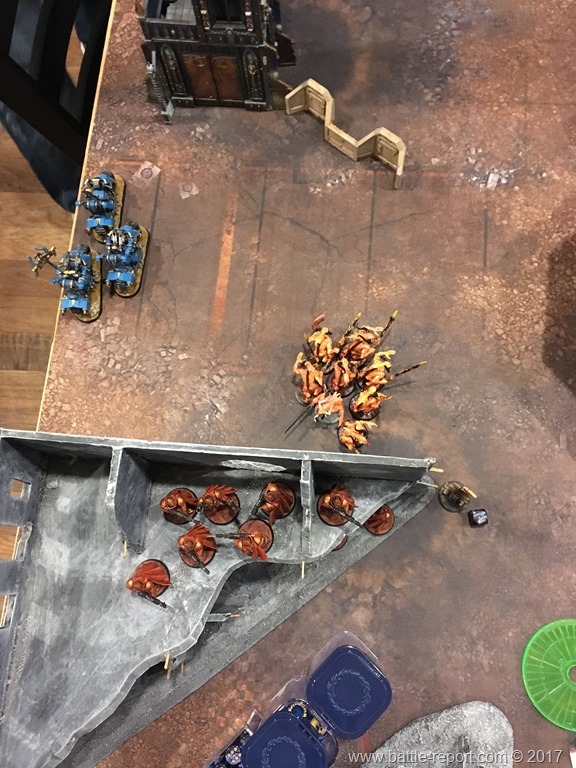 Unit of Bloodletters appeared out of thin air right next to Objective Marker 1. Samus came in from reserves at the center left of the battlefield. 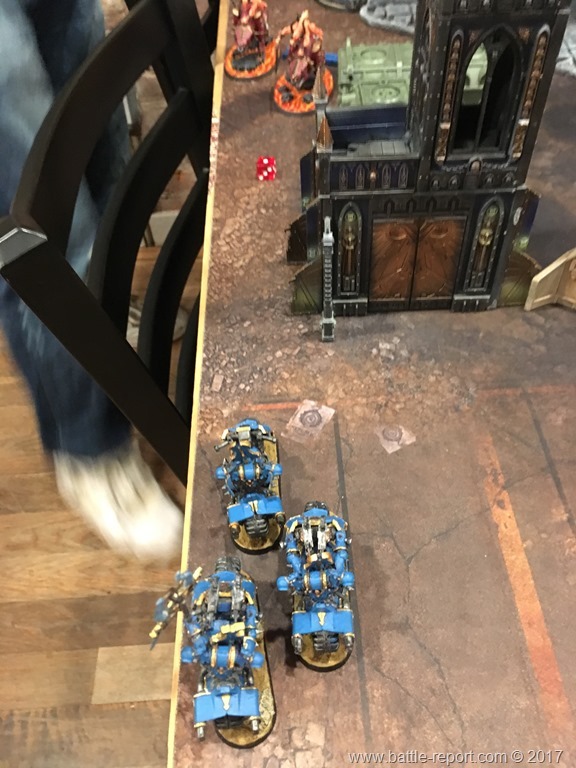 Maulerfinds and Bloodcrushers kept moving down towards closest enemy units in blue armour. 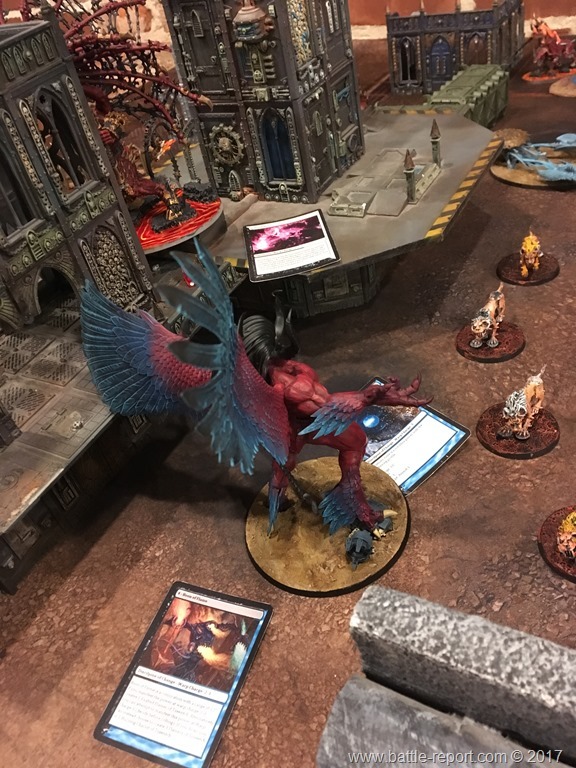 Bloodthirster ended up charging the group of Sorcerers minding their own business atop the Skyshield. 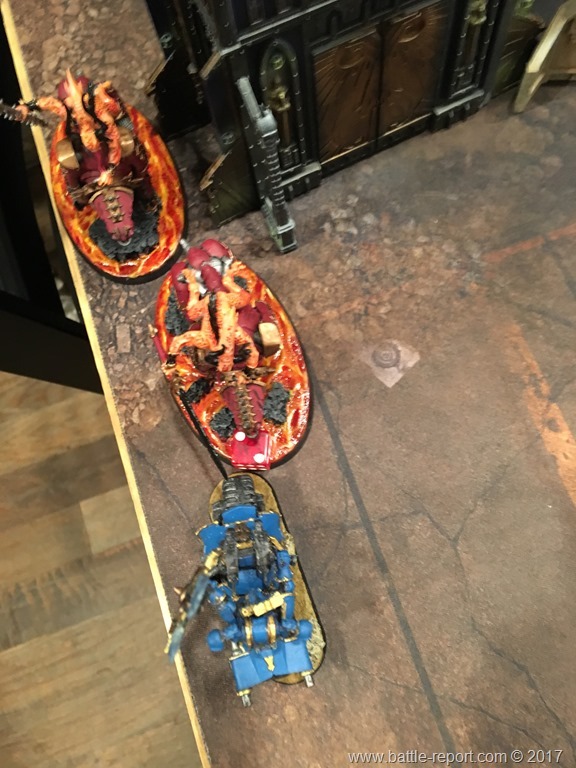 Chaos Lord on Juggernaut and his retinue of Fleshhounds continued galloping down the right flank towards the Tzeentch Cultists. 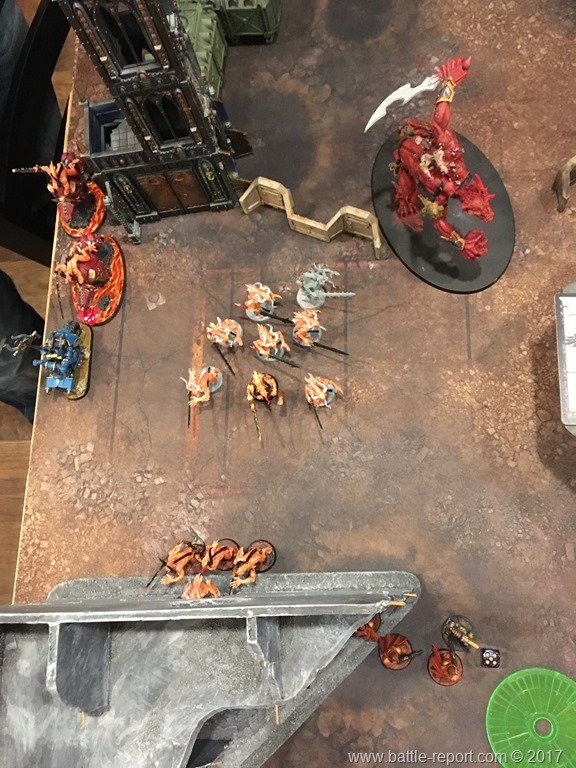 Freshly spawned Bloodletters decided to stretch their legs and run after their journey from the Warp. 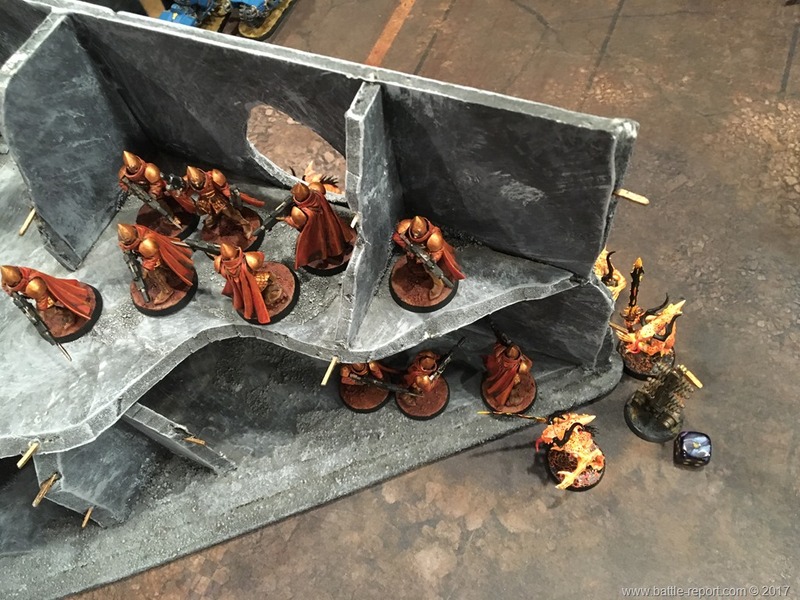 They were getting awfully close and personal with the other unit of Cultists at the bottom left of the board. 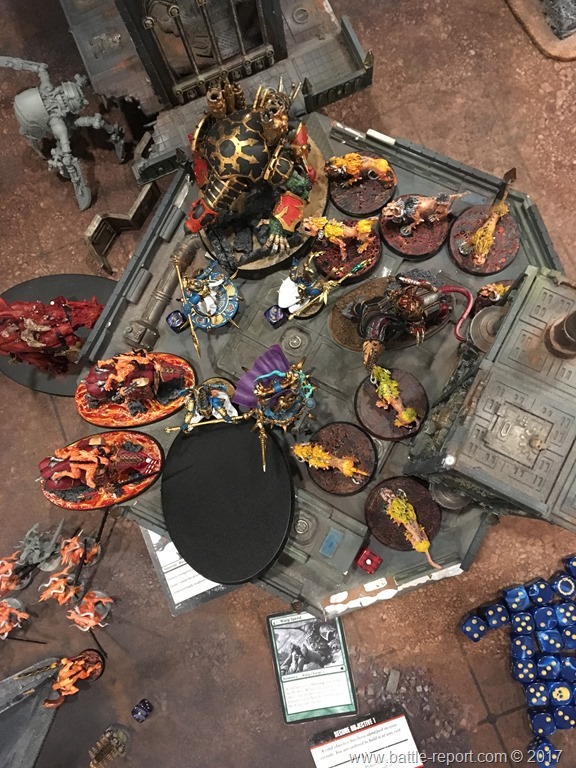 One of the three Maulerfiend charged the newcomer on the battlefield – the Burning Chariot of Tzeentch. Its Hammer of Wrath alone took one Wound off of the Chariot’s Rider. 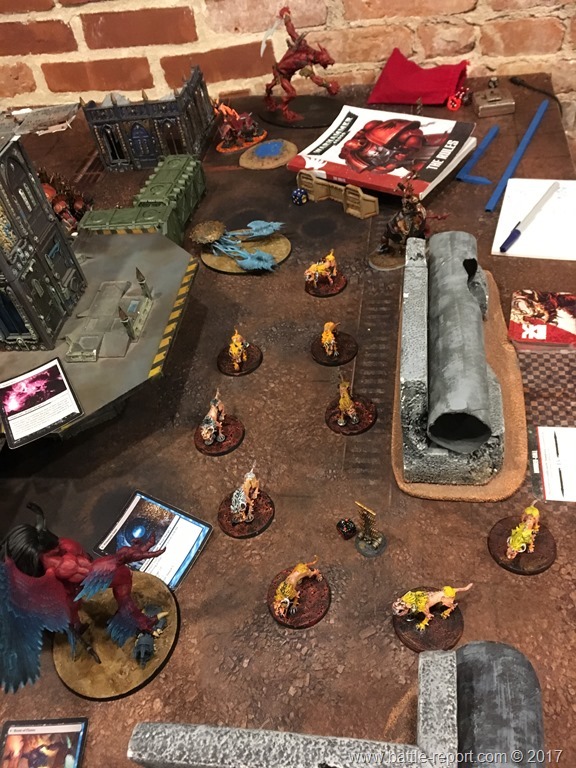 In a coordinated madness of close combat, Bloodcrushers ran their warpsteeds into the Chaos Bikers on the far left of the battlefield. 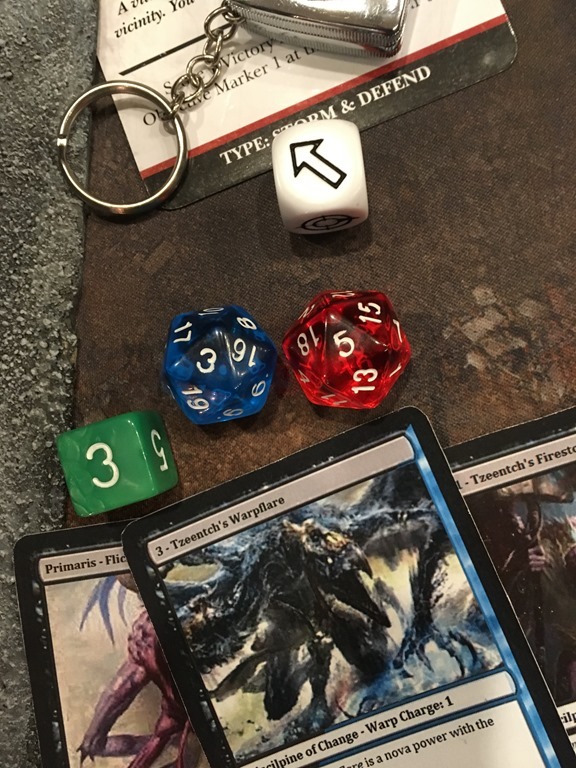 Bloodthirster all but ignored incoming overwatch for the Sorcerers and issued a challange. 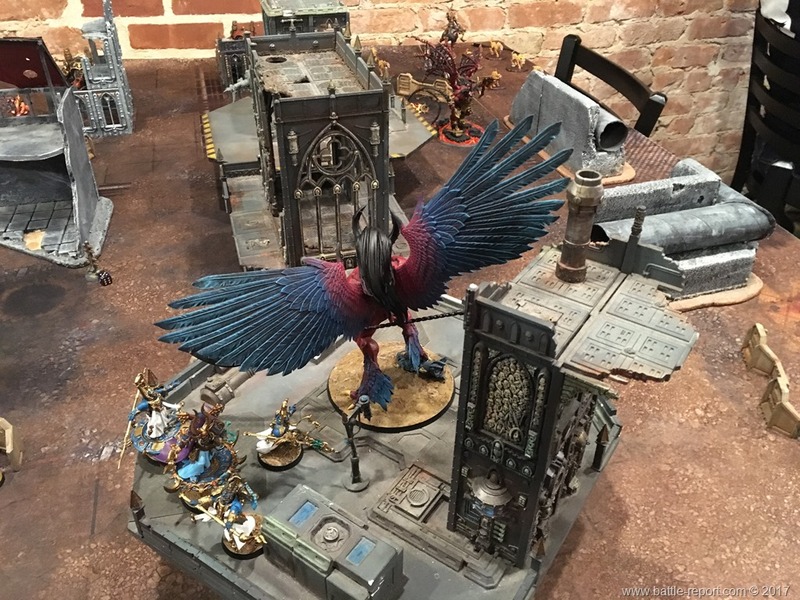 The brave sorcerer flying around on his Disc of Tzeentch, decided to protect the First Captain and his brothers and accepted the challenge. 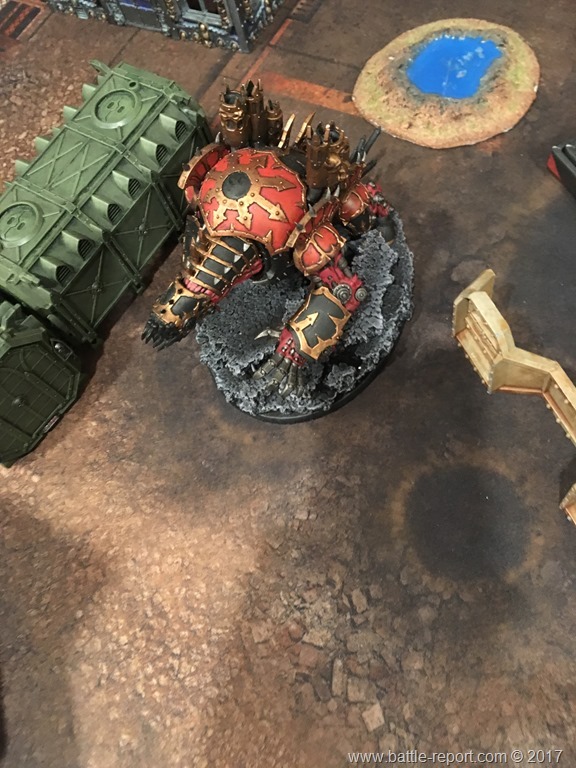 Chariot was no match for the Maulerfiend. 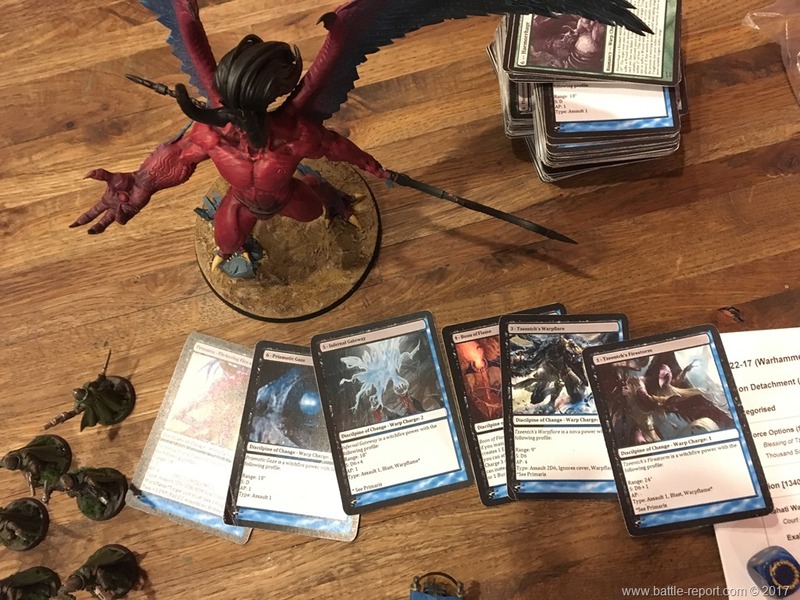 The melee monster sent it back to the Planet of Sorcerers with ease. One of the Bikers was removed as a casualty as well. 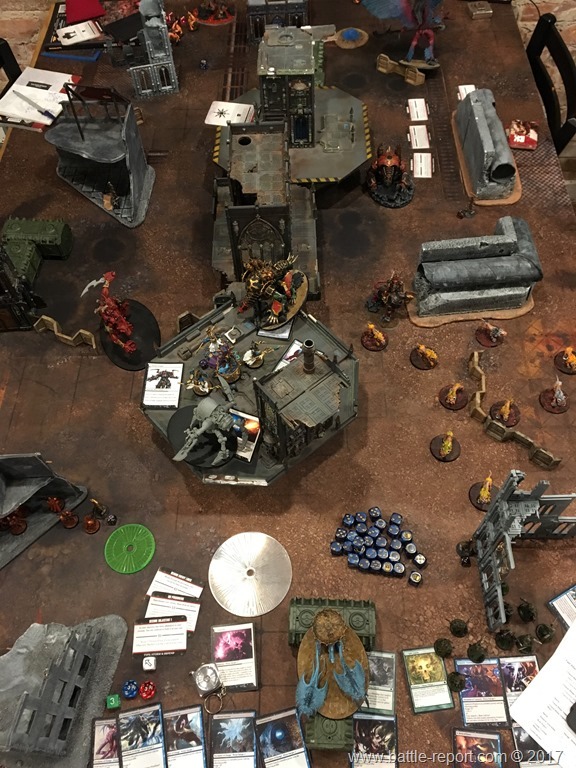 After the dust settled, Khorne ended its turn 2 with a 3:1 lead. 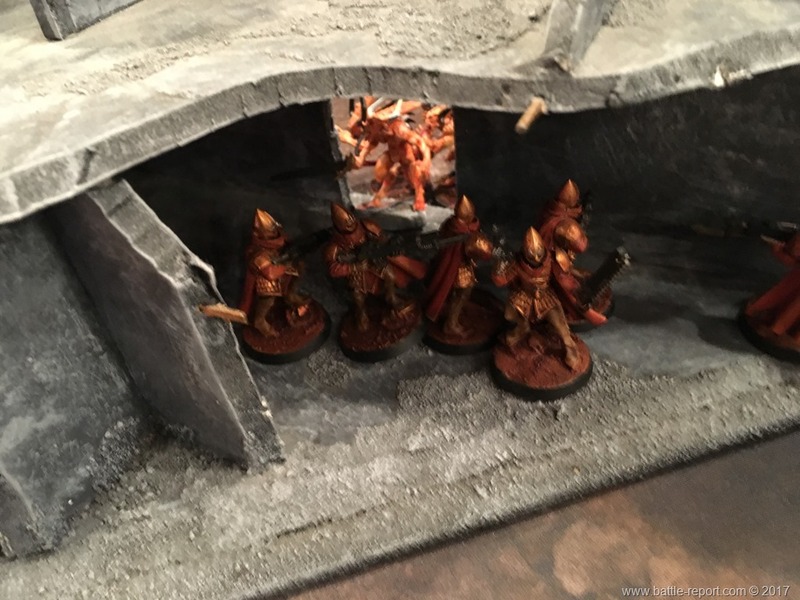 Sorcerers of Prospero used the Psychic phase to cast blessings on their unit in an attempt to survive close combat with the Khorne Bloodthirster. They were able to manifest Force, Endurance, Warp Fate and Diabolic Strength. 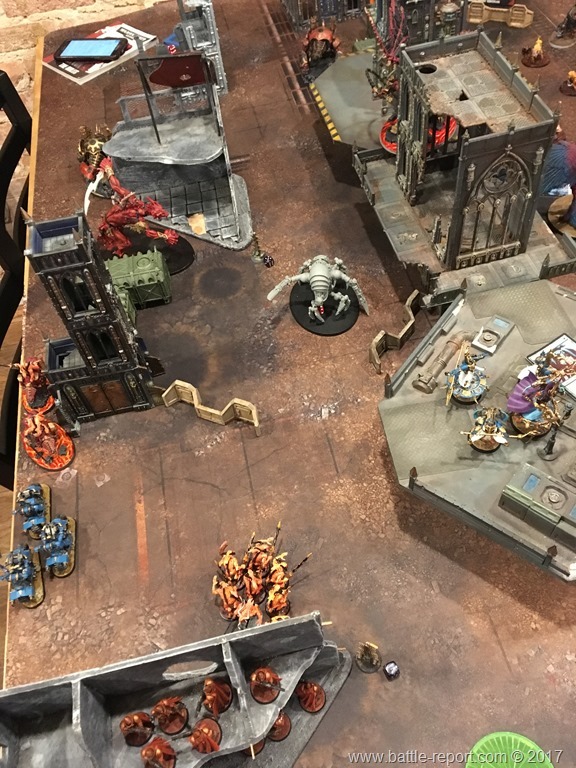 Cultists knew no fear this turn and charged the bloodletters. 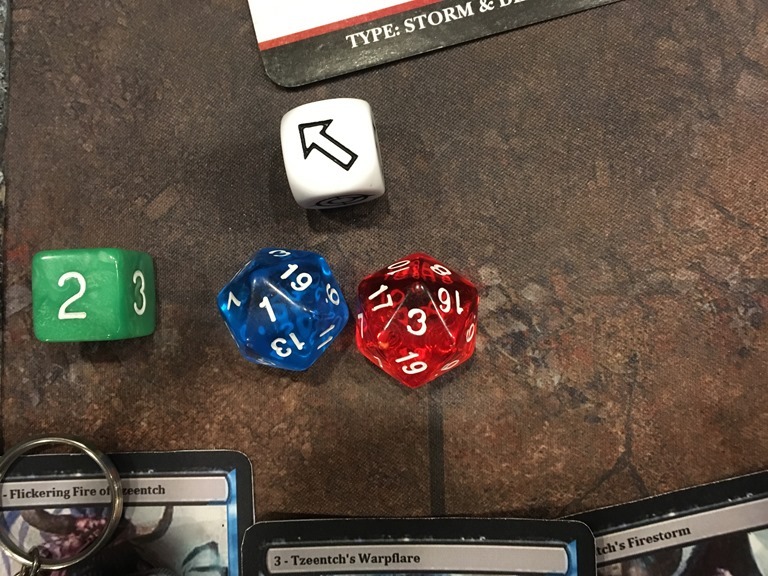 Two of the Prosperian Spireguard died to the Daemonic blades. 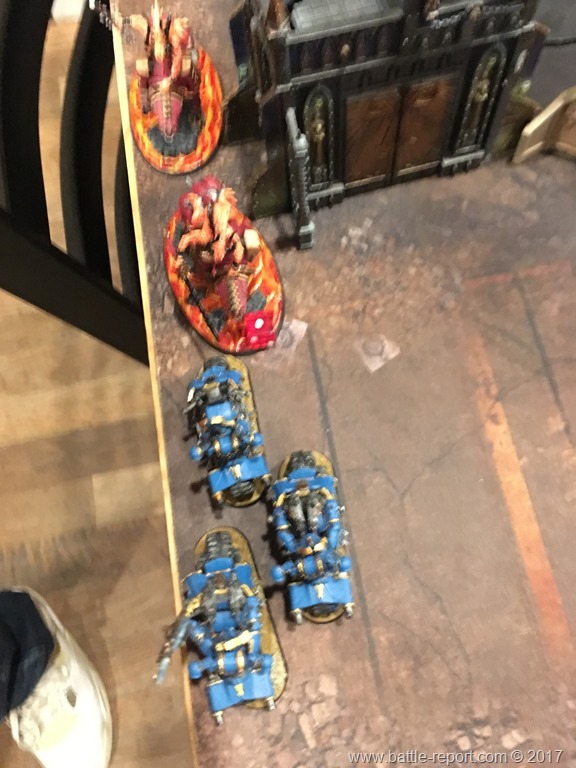 In the continuing melee with the Khorne cavalry, one of the Thousand Sons bikers bit the dust (pun intended), leaving just the Champion to hold the Daemons from advancing. 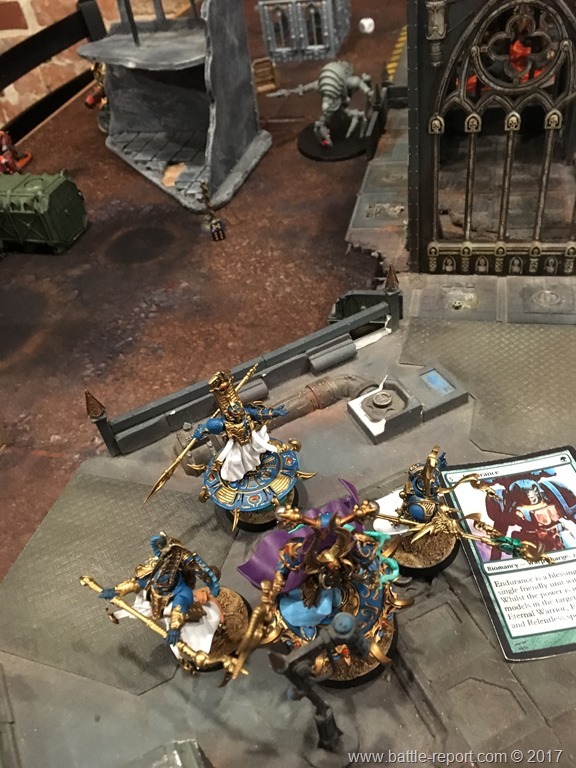 And then Tzeentch smiled on Crimson King’s children. 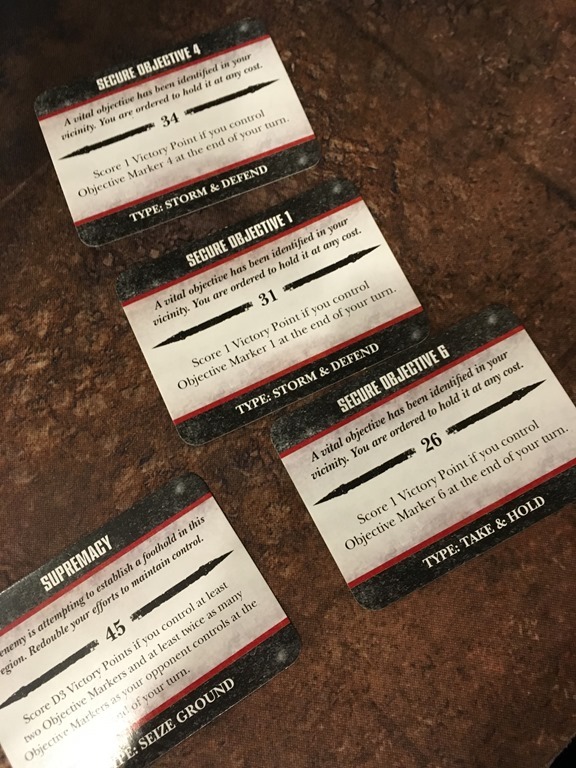 Sorcerers were able to strike enough blows at the Bloodthrister to banish it from the mortal realm. 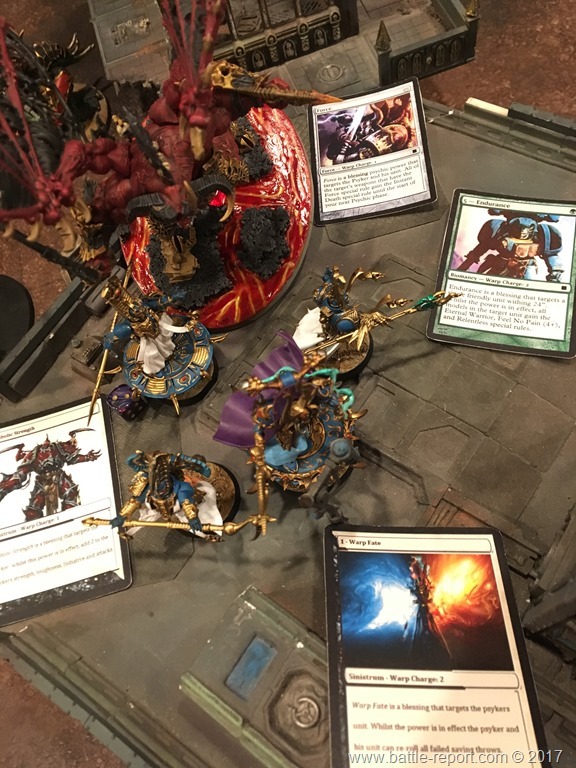 However Daemonkin kept on coming. They wanted more blood. They wanted more skulls for the Skull Throne. 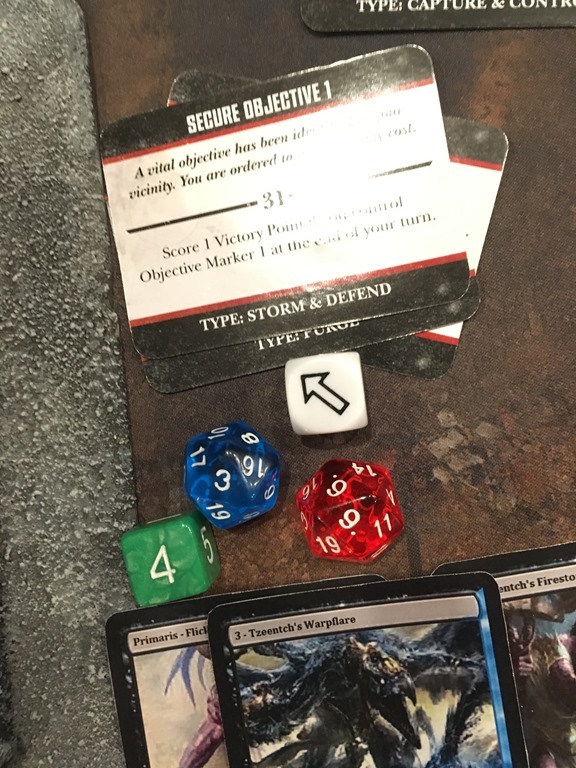 Turn 2 ended in a tie. 3:3. 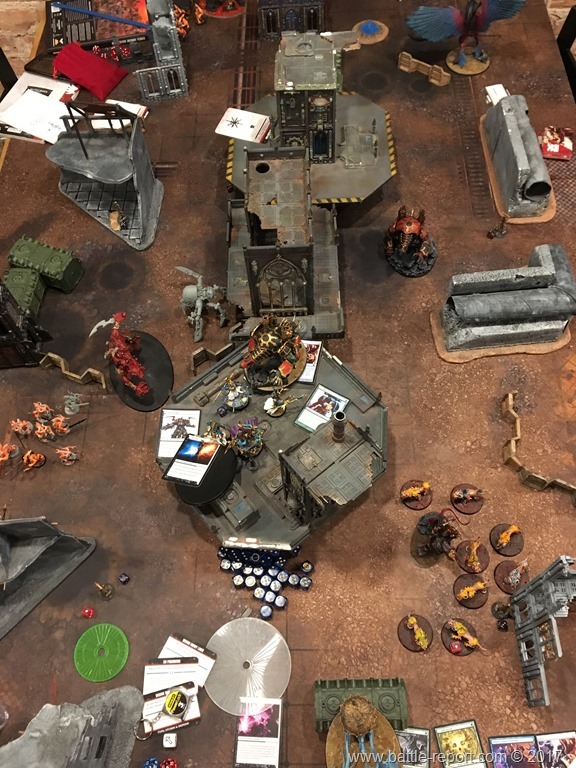 Two Maulerfiends quickly closed the distance and hopped onto the landing pad getting ready to charge Ahriman’s unit. Samus was not far behind. 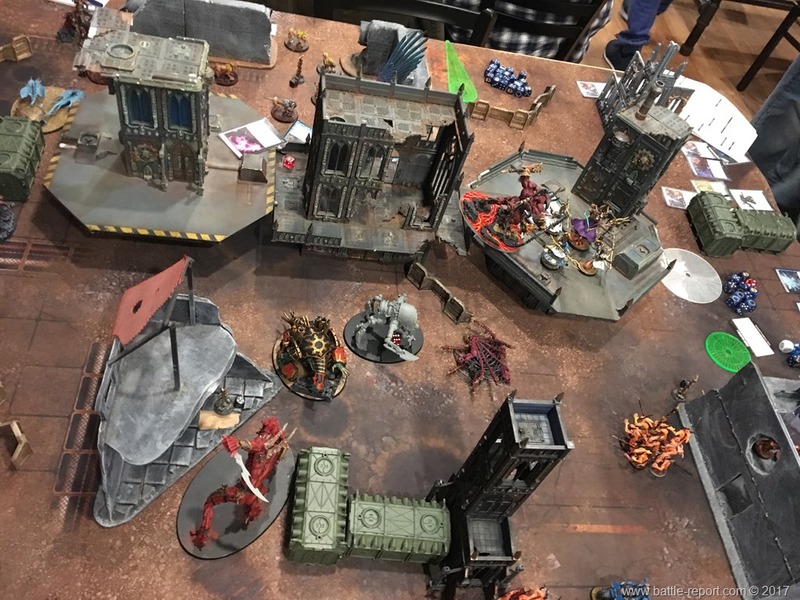 The third Maulerfiend kapt running down the center right of the board. 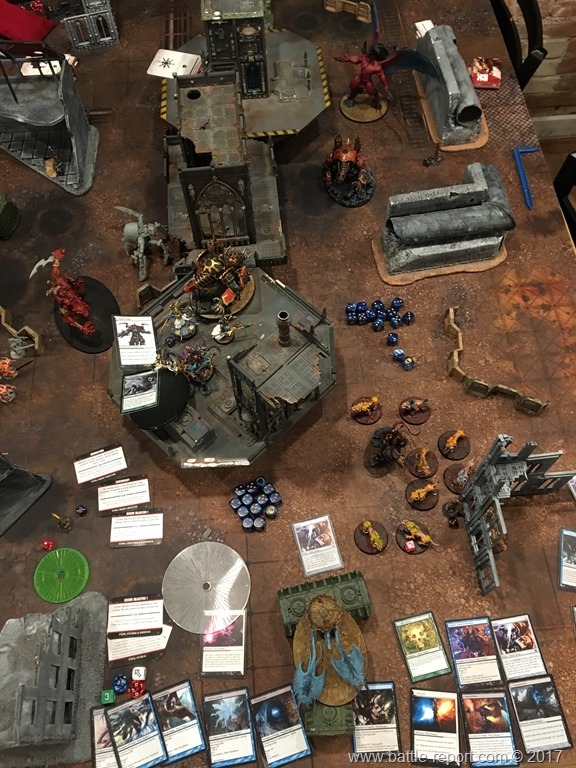 So did the Flesh hounds, their sights set on the Prosperian Spireguard on the bottom right. 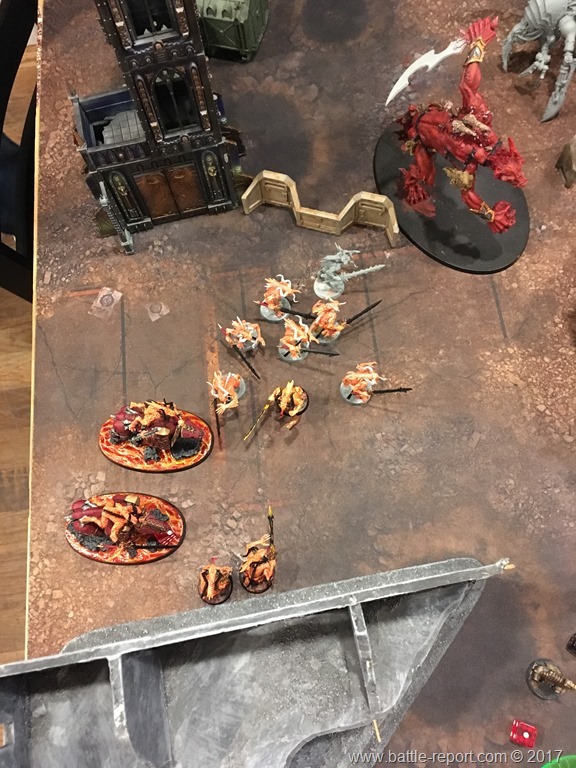 Another group of Bloodletters dropped to the ground from the Warp Rift, dead set on getting revenge for the fallen Bloodthirster. 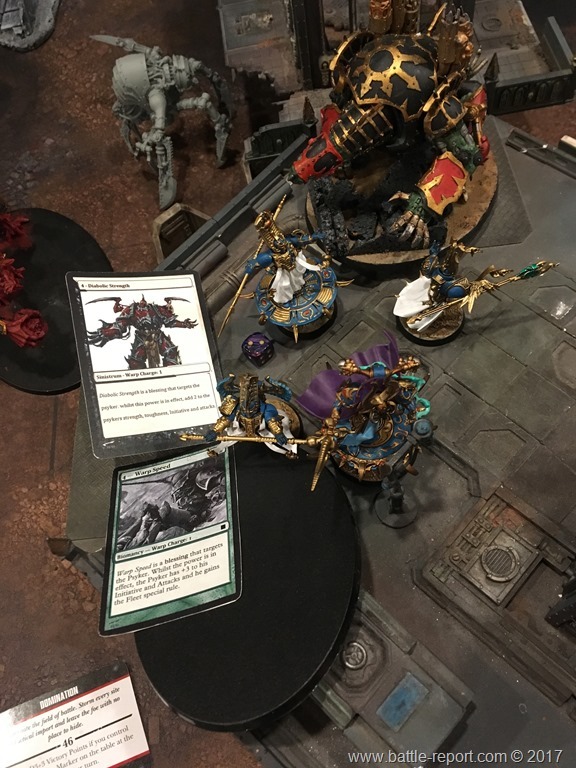 Wounded Exalted Sorcerer that helped slay the winged Daemon of Khorne, took another wound from the Maulerfiend and was on his last legs. 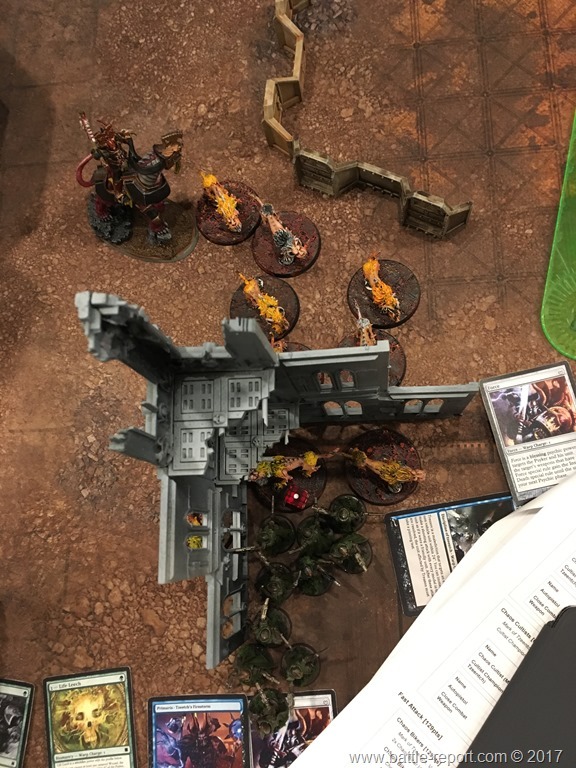 But the Daemon hordes kept on coming. 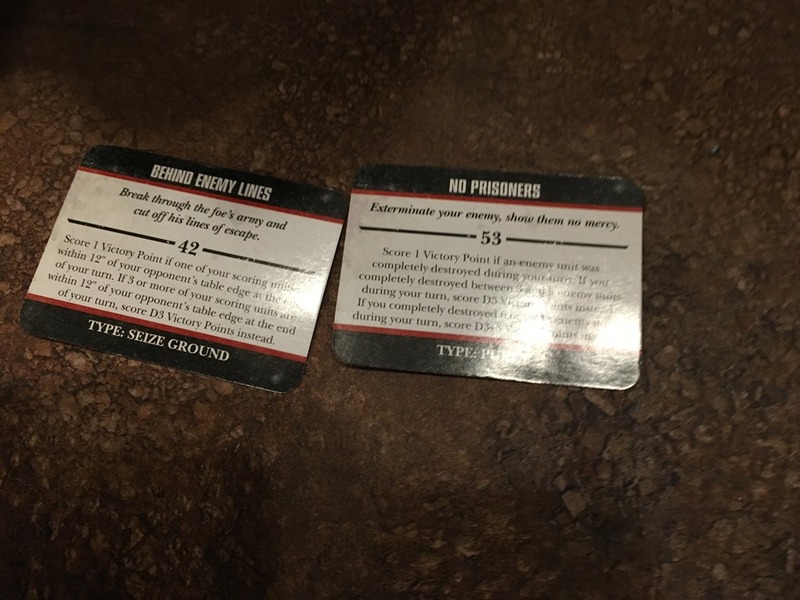 Flesh hounds charged the Cultists hiding in ruins in the bottom righth and tore all but three limb to limb. 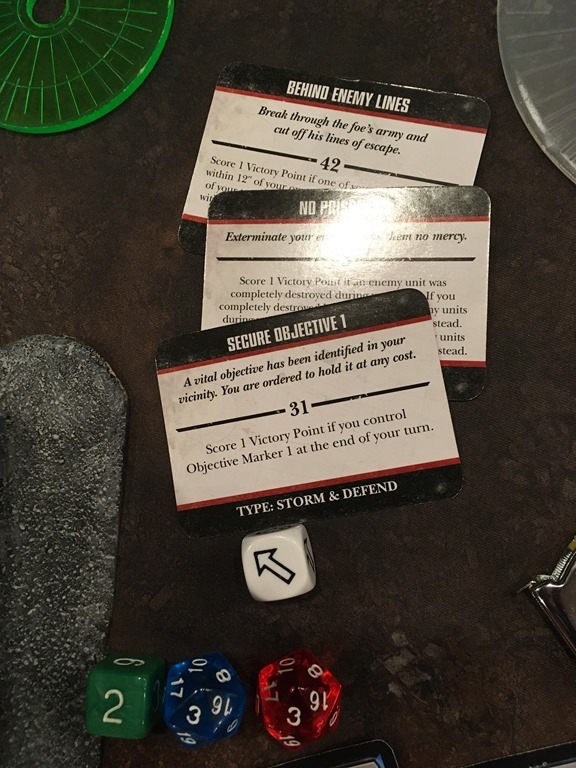 The remaining three Cultists were caught in the Sweeping Advanced and gave their lives in defence of Magnus’ cause. 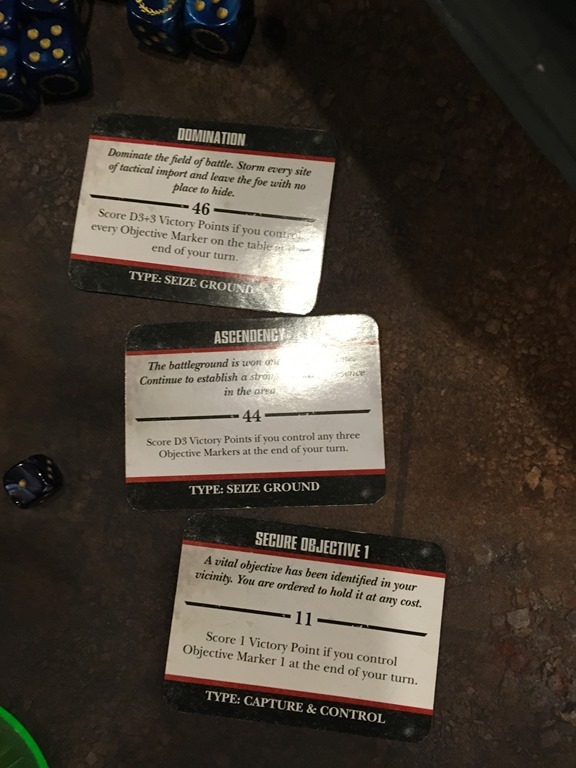 On the other side of the battlefield Prosperian Spireguard 4th valiantly died fighting the Bloodleters. Every last one of them was dismembered by the blood crazed Daemons. Biker Champion holding the left flank was overwhelmed too. 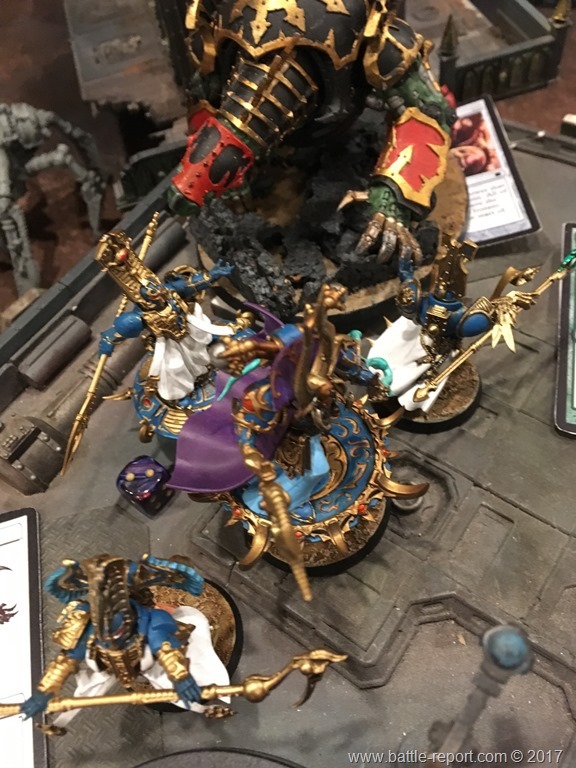 Once he was beaten to pulp the Deamonkin horde shifted their focus towards the First Captain and Chief Librarian of the Thousand Sons surrounded by his wizarding comrades. Remainder of Team Blue was encircled. There was no escape. Death was coming for them. At the end of their turn, Red team was in the lead 5:3. 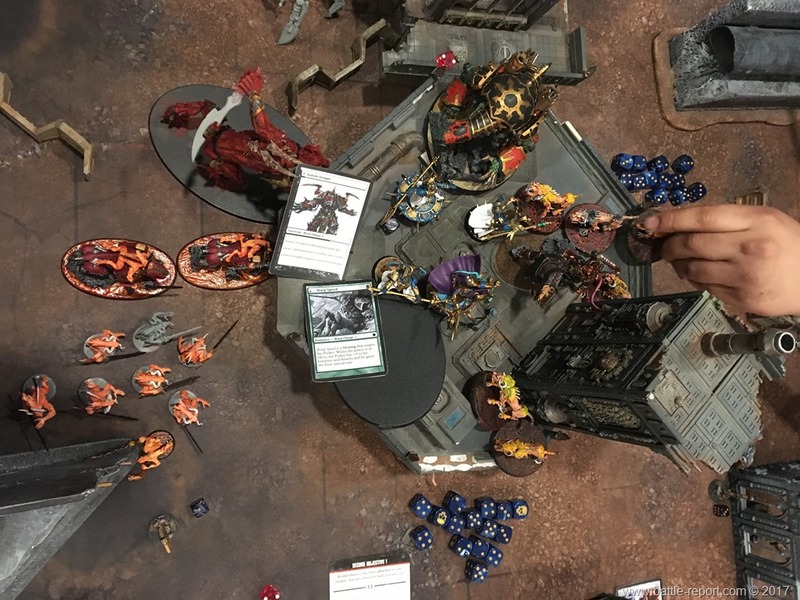 Magnus, seeing his children were in mortal danger, dropped from the sky, turned around and was staring down the Maulerfiend charging into the fray. Samus near by was interfering with their ability to manifest blessings, which is why the sorcerers only manifested Diabolic Strength and Warp Speed this time around. They could do little to fight of the two Maulerfiends locking them in combat. But they held. 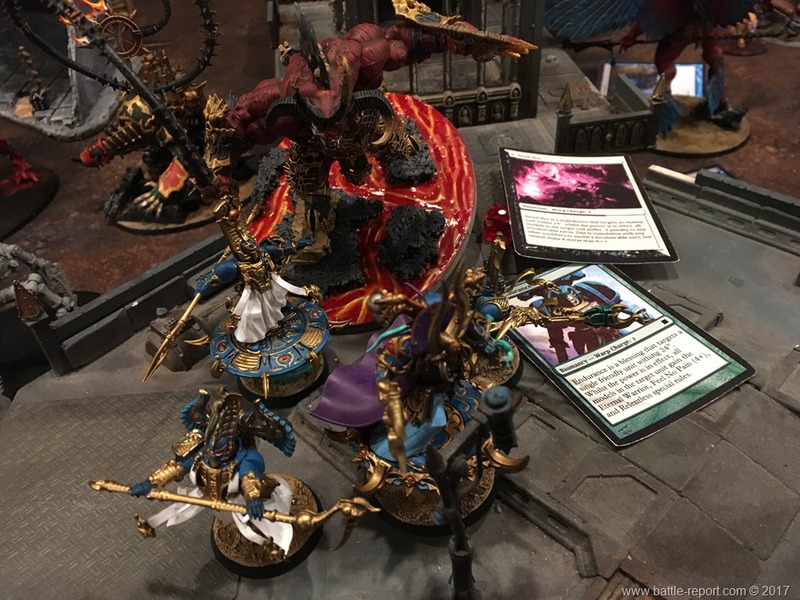 Yet again, Ahriman was desperate for his Deamon Primarch father to come to the rescue. 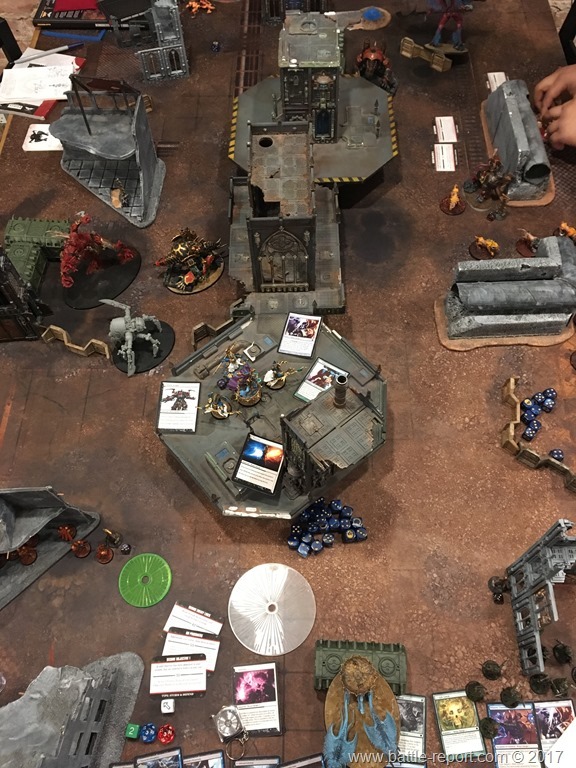 Turn 3 ended with the result Red Team 5 – Blue Team 3. It was time. 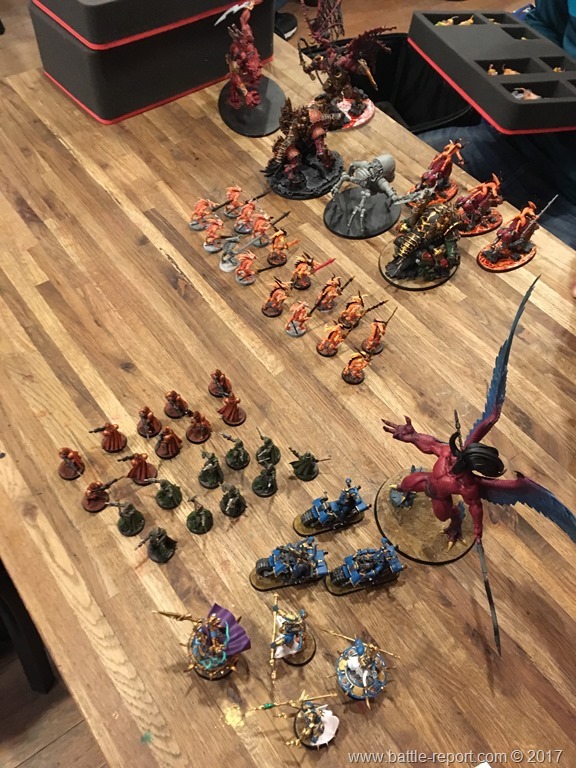 Every ablebodied Khorne Daemon charged the hated Tzeentch sorcerers. There was no way out for them. “We’ll skin them alive! muahahaha”. 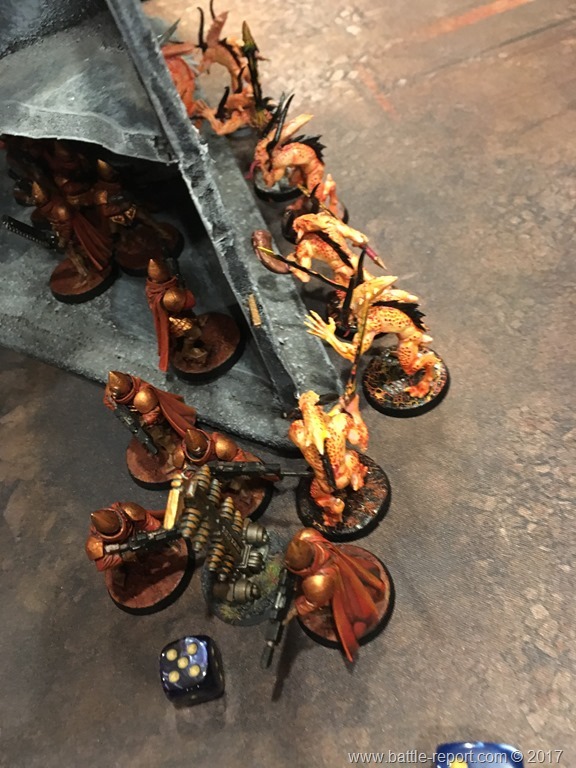 Taking on wounds, yet somehow surviving Ahriman and his Exalted Sorcerers bodyguards held off the onslaught of the Khorne Daemonkin army. 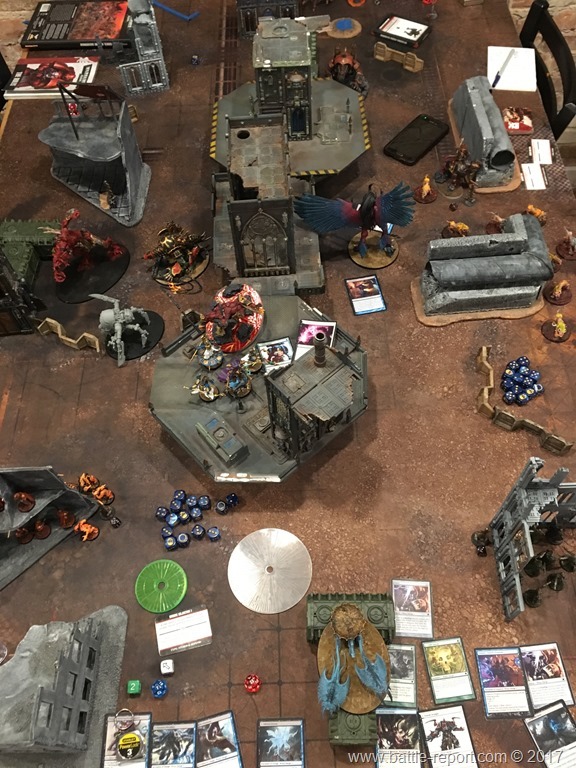 At the end of Khorne Daemonkin turn 4, unfortunately our hosts at Brooklyn Strategist were closing shop, so we had to call the game prematurely. End result was 9:3. 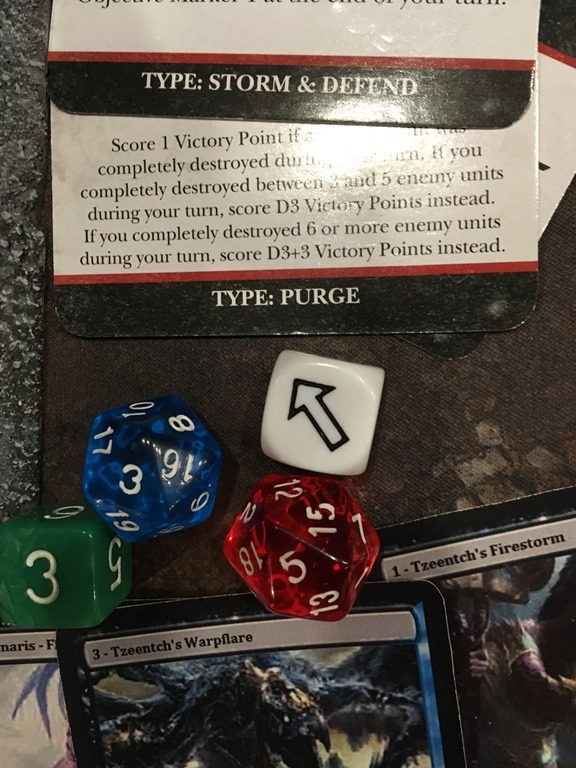 Khorne Daemonkin Victory.